Sign up today to attend Bisnow’s Tysons State of the Market event on Thursday, January 24. 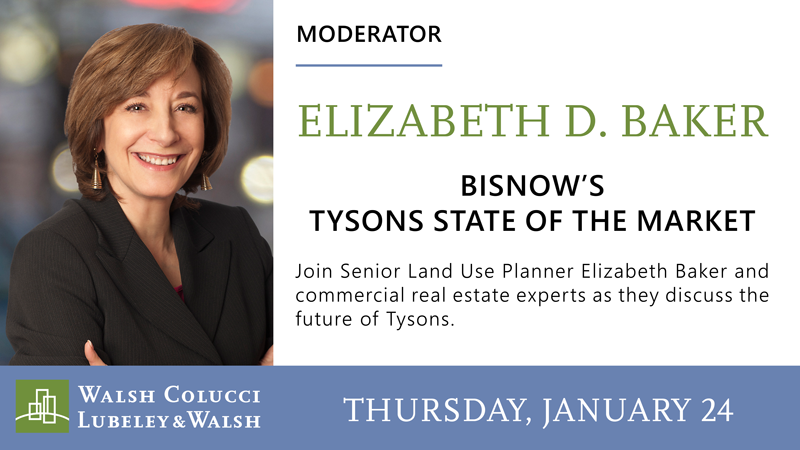 Join Senior Land Use Planner Elizabeth Baker and commercial real estate experts as they discuss the future of Tysons. How will 1.5 M SF of office under construction impact the area’s 17.8% vacancy rate? How can the area’s office market snag and retain corporate headquarters? After years of booming development, how long will the Tysons market remain hot? Are developers able to bring culture-building retail to Tysons in a rapidly changing retail climate? How is Tysons multifamily differentiating itself from competing markets? Will Tysons experience any reverberating waves from upcoming developments? Thursday, January 24 | 7:30 a.m. – 10:30 a.m.